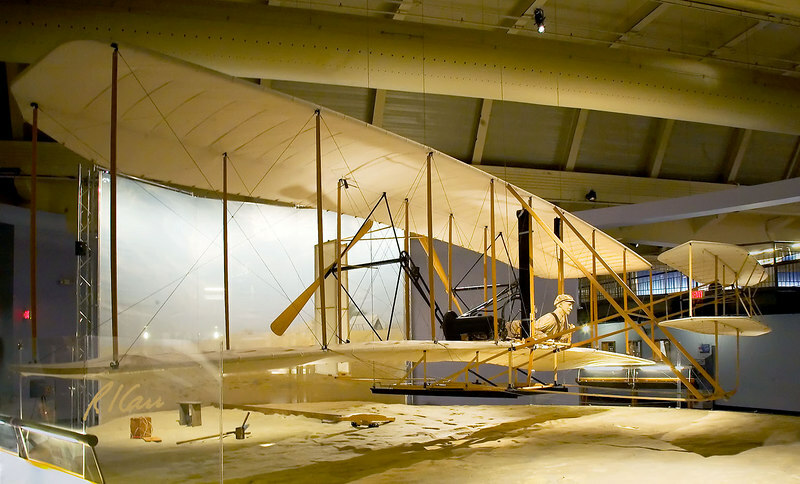 'This Wright Flyer is the world's most accurate reproduction of the original 1903 Flyer. Just weeks before the Centennial of Flight celebration in December 2003, this Flyer made several successful flights at the Wright Brothers National Memorial in Kill Devil Hills, North Carolina. Trained pilots attempted to fly this reproduction on Dec. 17--exactly 100 years after the Wright brothers original first flight. Unfortunately, rain and low wind speed prevented the Flyer from getting up in the air on that day. 'The Experimental Aircraft Association (EAA) commissioned The Wright Experience of Warrenton, Virginia, to build this authentic reproduction in celebration of 100 years of flight. As a sponsor of "EAA's Countdown to Kitty Hawk," Ford Motor Company generously donated this Flyer to the collection of The Henry Ford.' Henry Ford Museum, Dearborn, Michigan. Photo in August, 2006.